In 2006, Cape Town experienced more than 150 days where air pollution levels were higher than internationally accepted standards. This means that for nearly half of 2006, the people of this city were breathing in smoke and gases that are harmful to their health. 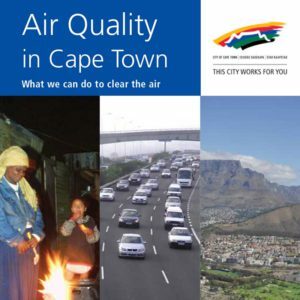 The City of Cape Town’s Environmental Resource Management Unit commissioned the research and publication of a booklet on Air Quality, in 2007, designed to help readers understand how they can help to keep pollution out of the air we breathe.